Whether you’re directing traffic in your commercial parking lot or outlining safe loading zones on your business’s dock, safety bollards are essential in making your mark. With safety bollards you offer a clearly visible, well-entrenched sign that helps to direct drivers and pedestrians in and out of safe areas, resulting in fewer accidents and more simplified operations. They can also act as a protective barrier to prevent collisions with your property. 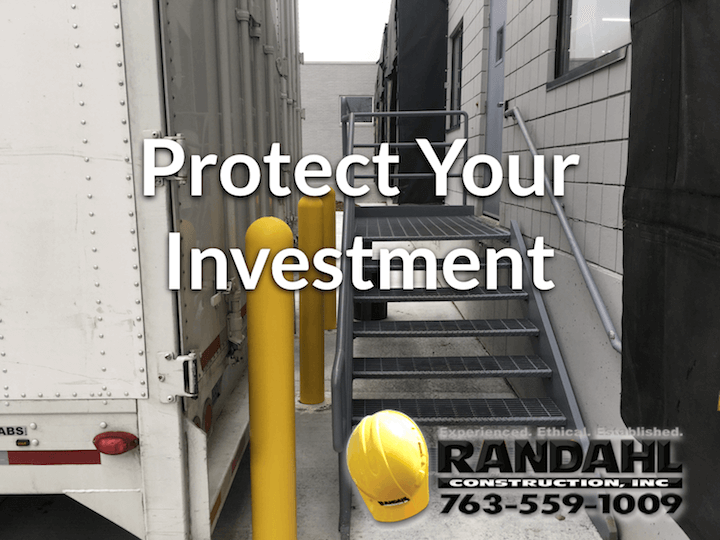 With Randahl Construction, Inc. we are an experienced Safety Bollard Installation Contractor and can easily install the safety bollards of your choice in the configuration you desire. One of the benefits of safety bollards is their sturdiness and durability. The best safety bollards are constructed of concrete, covered in steel and often sleeved with a yellow polyethylene cover. This makes them especially resistant to bumps, dings, and crashes. We offer a complete installation service to ensure the integrity of your safety bollards, including concrete cutting and custom-poured new concrete-filled safety bollards trimmed to whatever height you desire. We work throughout the Twin Cities area. Indoor or outdoor, docks or warehouses, we can adapt to the needs of multiple types of sites. This includes industrial plants, truck loading areas, parking lots, and various types of manufacturing and production facilities. Our expert concrete team can consult with you to determine the best options for your safety bollards, and how to customize installation to suit you. If your safety bollards have taken a few hits lately, we can handle bollard replacement and repairs. We can re-cover or re-fill your existing bollards and repair damage to the surrounding concrete, or we can pull out the damaged bollards and replace them with new ones. We recently replaced a bollad in a high traffic area at the Besy Buy Coperate center in Richfield, MN. We cut out the existing damaged bollard, poured a new foundation and installed a 48” high bollard to protect their builing. 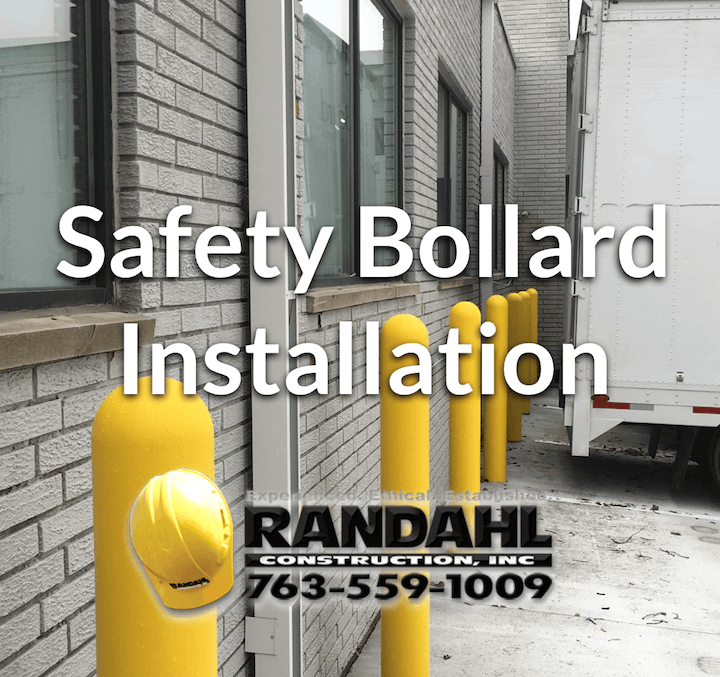 If you’re interested in installing safety bollards at your business location, call us at 763-559-1009, or use our contact form to get in touch today. 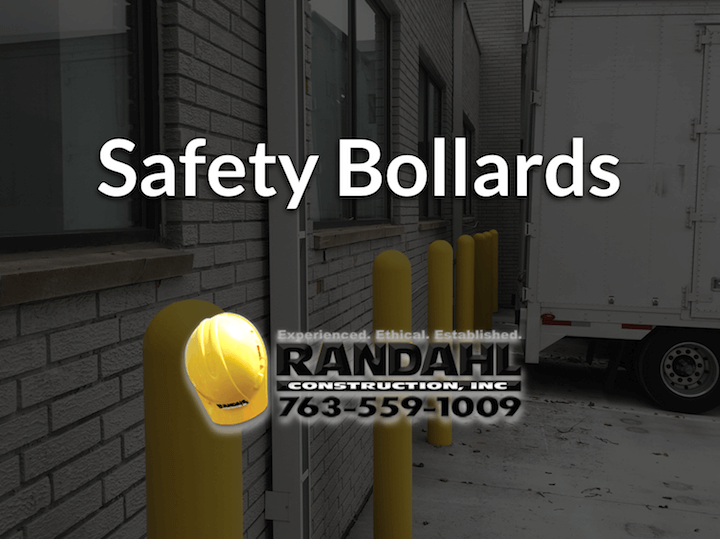 Our qualified experts will survey your site and determine exactly what is needed to implement your quality safety bollards, and effectively protect your business with services from Randahl Construction, Inc.